In terms of skiing, Colorado is definitely one of the top states in America. Home to major skiing destinations like Aspen, Breckenridge, Vail, and more, Colorado provides a lot of great options for anyone interested in skiing, snowboarding, and dozens of other winter activities. The Centennial State also gets a lot of snow throughout the year, so skiing season almost never ends for Colorado residents and visitors. Sitting among the Front Range of the Rocky Mountains, the city of Boulder is a prime spot for skiing in Colorado. Lots of great ski resorts can be found within one or two hours of Boulder, with hundreds of different runs to try out for beginners, intermediate skiers, and experts. So if you’re planning a skiing trip around Boulder, here are some details on the top resorts and ski areas to consider. 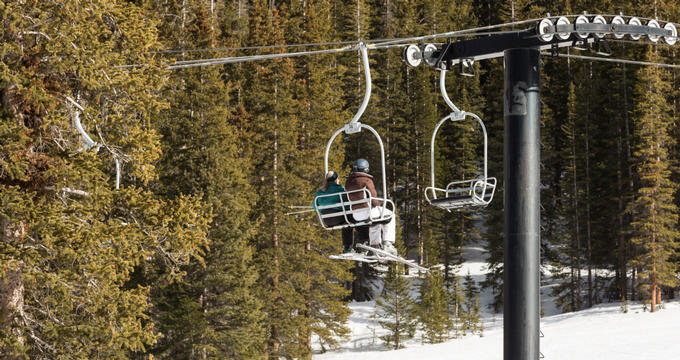 Not far from Boulder, Eldora is a perfectly situated ski resort with a lot to offer for skiers of all ages and abilities. When compared to other locations around the state of Colorado, Eldora Mountain has some of the lowest admission and rental fees, so it’s a great spot to stop off if you’re traveling as a group and looking to keep your costs down. This ski resort features almost 700 acres of skiable land and offers no less than four terrain parks. Best-suited for day trips, Eldora doesn’t have any accommodation, but that shouldn’t be a problem for Boulder residents as the resort is only 40 minutes away. One of the most famous ski resorts on Earth, Vail Ski Resort is well-known for its remarkable views and the beauty of its nearby town, which has attracted plenty of A-list celebrities over the years. Located in Eagle County, about two hours outside of Boulder, Vail stretches out over more than 5,000 acres of skiable ground and features over 190 individual runs, making it one of the largest ski resorts in the state. Over half of the runs at Vail are classed as black, so this resort is well-suited to advanced skiers who are really looking to test themselves. One of the most popular and beloved ski resorts in all of Colorado, Breckenridge attracts huge crowds each and every year due to its awesome service and enormous array of runs. Over 150 different ski trails can be found at Breckenridge, with plenty of easy greens all the way up to supremely challenging double black runs. Around 3,000 acres of skiable land are featured at this resort, with 32 different ski lifts and huge terrain parks too. The resort also offers lots of options for lodging and dining, and it’s only about 90 minutes away from Boulder. Compared to a place like Breckenridge, Loveland is relatively quiet and uncrowded. It’s a popular ski area with a lot to offer, but many skiers in Colorado prefer to visit the other resorts over this one. So if you’re looking for a great quality skiing zone with minimal crowds, Loveland is a fine place to visit. Ski season at this area runs from October through to the middle of May due to the high elevation and huge amounts of snowfall. Almost 100 different runs can be found at Loveland and it’s only a little over an hour’s drive away from Boulder. Situated in the White River National Forest, Araphoe Basin, often simply known as ‘A-Basin’ or 'The Basin' is another top-quality ski location for Boulder, CO. This ski area contains over 1,300 acres of skiable land and over 130 individual runs of varying difficulty. Multiple chair lifts and magic carpets help peole get around this location and two huge terrain parks provide plenty of freedom and space for skiers to express themselves and test their skills. The Basin is about an hour and a half away from the city and is renowned for its extra-long skiing season that can run into June and even July in some cases. So if you want to do a little skiing and snowboarding in the spring and early summer, A-Basin is a great choice. Three separate lodges can also be found at The Basin with a variety of eateries and accommodation options.